It was theatre of the mind, on one of radio's biggest theatres. 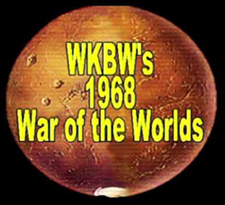 On Halloween Night 1968, Buffalo's 50,000-watt blowtorch WKBW did an updated version of Orson Wells' War of the Worlds, about a Martian invasion of Earth. The brainchild of WKBW program director Jeff Kaye, the show faithfully followed the script of the Wells' original, but added local references and used reporting technology that did not exist in 1938, when the original aired on CBS' Mercury Theatre of the Air. The 1968 version was presented as if it were part of the station's Top 40 format, complete with the tunes. If you weren't paying attention to WKBW's numerous disclaimers, you would have thought it was real. The cast included top-of-the-hour newscaster Joe Downey, deejay Sandy Beach, studio anchors Downey, Henry Brach and Kaye, and reporters Jim Fagan and Don Lancer from WKBW-AM, and John Irving and Irv Weinstein from WKBW-TV. The show started at 11 p.m. Calls from concerned listeners became so frequent that Kaye demanded director Dan Kriegler let him break into the pre-taped programming with the following announcement: "What you are listening to is a dramatization of H.G. Wells' War of the Worlds on WKBW radio, 1520 on your Buffalo dial. I repeat, it is a dramatization; it is a play. It is not happening in any way, shape or form. What you are listening to is a dramatization of H.G. Wells' War of the Worlds as being portrayed on WKBW 1520 Buffalo. The time is two and one half minutes before twelve o'clock." The show was reprised three times on WKBW with different disc jockeys (Jack Armstrong in 1971, Shane in 1973 and Jim Quinn in 1975. Enjoy WKBW's 1968 dramatization of H.G. Wells' "War of The Worlds" (UNSCOPED) here . Enjoy WKBW's 1968 dramatization of H.G. Wells' "War of The Worlds" (SCOPED) here.